Our organizational philosophy believes that customer satisfaction and business objectives are mutually dependent. Our policy assures maximum effectiveness and efficiency through all processes and systems making sure that every aspect of the company activity is aligned to satisfy our objectives and customer needs. Our policy emphasizes the need for measuring and analyzing performance in order to confirm that planning and problem solving have led to quality improvements. The continuous monitoring of systems performance is essential and performed with the use of the most powerful diagnostic tools. At PERI, safety always comes first. Our absolute commitment to a safe work environment is at the heart of our operations. Our comprehensive, in-depth safety policies, IMS systems and programs are designed to engage the entire workforce in the delivery of safe work on all our projects. PERI is committed to upholding the highest standards in environmental sustainability across all aspects of our operations. Our corporate approach is to manage the environmental risks and impacts arising from the process of going about our business activities. We seek to reduce our impact, mitigate issues and be future forward in our approach to protection and conservation of environment. We are focused on the impact we make, both to society and the environment. The commitment our employees make every day to ensure a safe working environment is critical to our operating system and to delivering a safe and clean workplace. PERI L.L.C. is proud to be a corporate member of the British Safety Council, which works alongside its members to achieve the vision, that no one should be injured or made ill at work. Our continuous improvement processes are repeatedly enhancing the quality and cost-effectiveness of our products and services. 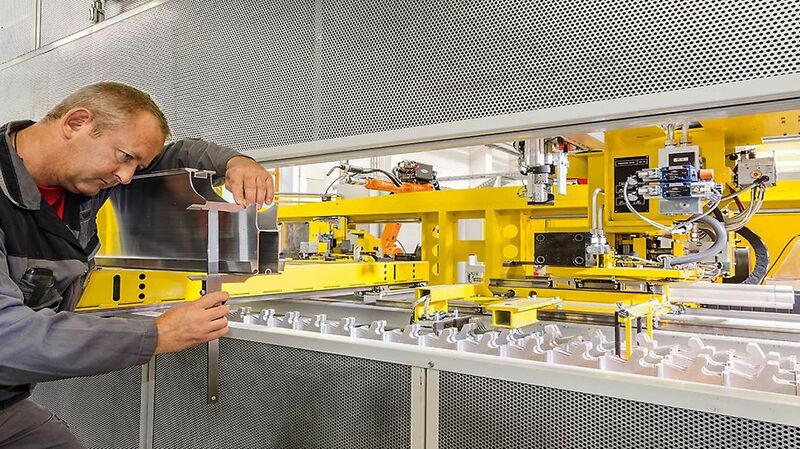 We invest in innovation and the development of long-lasting, sustainably sourced products to help maintain competitiveness for our customers and projects. This achievement recognizes our continuing commitment to the environment. 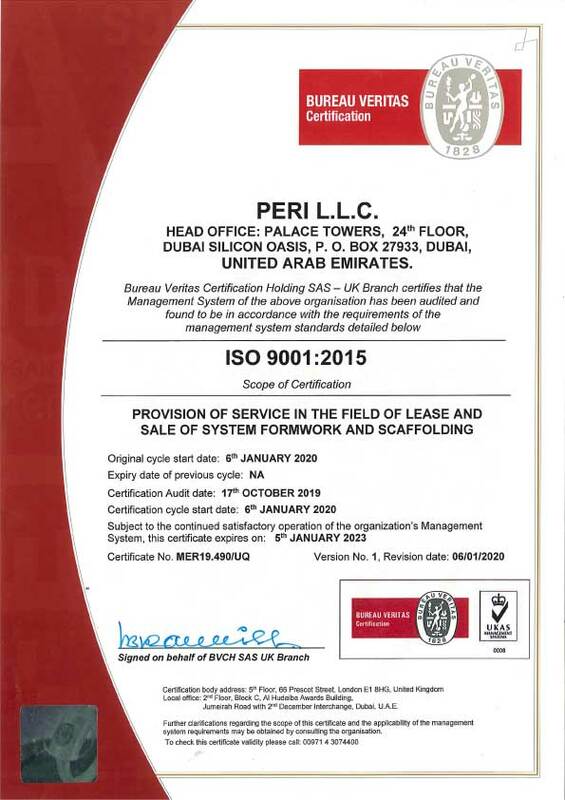 PERI UAE is committed to maintaining the highest standards of environmental management by actively reducing the impact our businesses have today and in the future on the environment. It is our employees that bring our commitment of environmental stewardship to life every day. 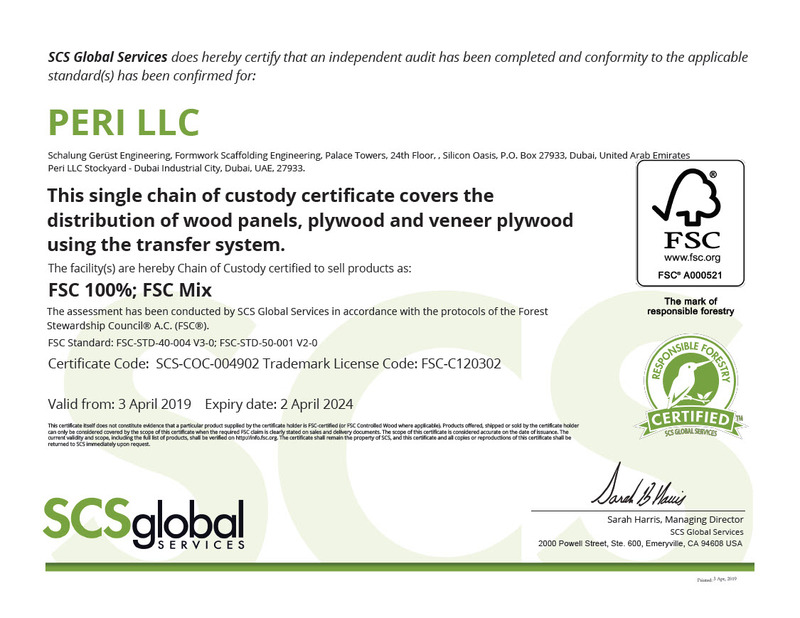 FSC® Certification ensures that products come from responsibly managed forests that provide environmental, social and economic benefits. 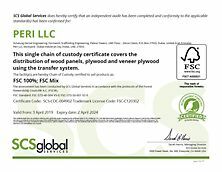 FSC® Chain-of-Custody certification traces the path of products from forests through the supply chain.